Don’t tell a soul but some Woman is looking to get BIT and bit hard! Just wait until I’m finished playing. See how over-stimulated I’m getting? I’m up on two paws. This doesn’t bode well for either of my peeps. 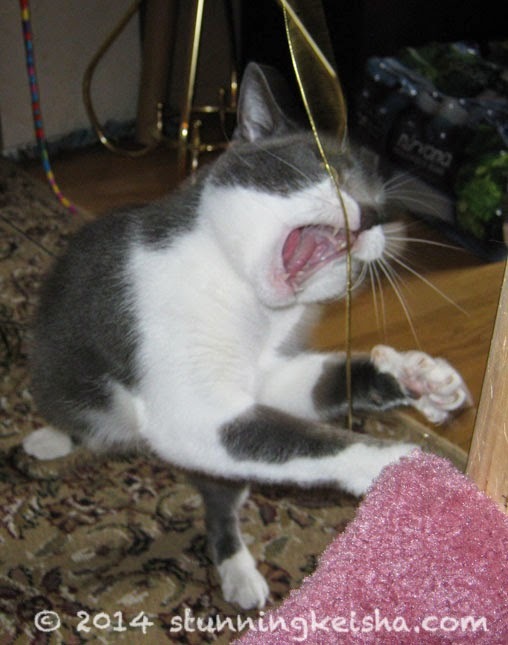 But that will have to wait; I have a rubber string to attack first. OK peeps, don’t all raise your hands but who’s volunteering to get bit? Any cats out there wanna raise their paws? If I were your humans, I'd be looking for a hiding spot! MOL, I get enuf bites from Vampire Maurice. Those are fearsome fangs and we think your peeps may want to put on some welder's gloves. Kill the string, CK! Then look out humans! You look SERIOUS, CK!! - Crepes. No thanks! I would prefer not to get bit! haha!Your peeps are definitely asking to get nipped though for sure|! Good luck to your hoomans! you got the bitey loaded and ready to launch CK! 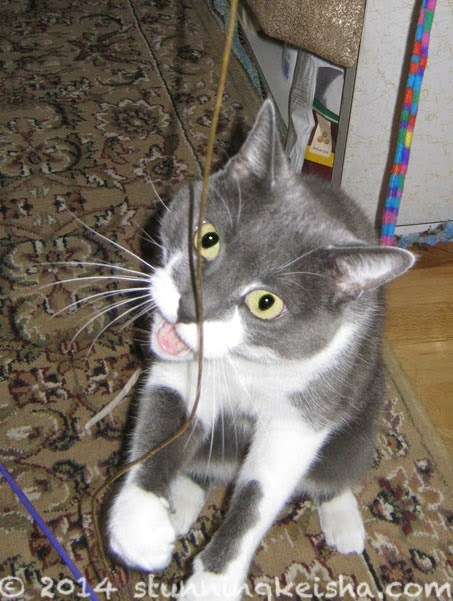 Very impressive fangs and biting technique CK.....I hope you don't have any particular human or beast in mind to attack but will be sticking with the string thing???? The world is safe as long as there's string....! We'll settle for a love bite. You have mad eyes CK. Your humans should be very afraid. CK, that look is what gets referred to around here as, "All wound up!" You have a good way to keep your humans in line- it would work on me! Ohhhh, I can see it in your eyes, CK. That's scarier to me than the sharp teeth. Oh yeah, CK, we can see it for sure! Run, TW and Pop! RUN!!! Thanks for linking up to our pet parade CK! oooh yeah, we saw THAT one coming!! MOL!